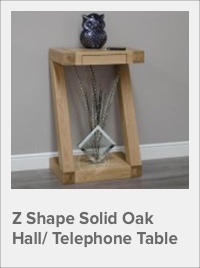 The Z Shape Solid Oak Large Hall / Console Table with its exceptionally unique design, will look stunning in any room setting. This hall / console table features sturdy Z-shape leg supports, solid oak drawer boxes with dovetail joints, metal drawer runners and a push action to open/close the drawers. The three shallow drawers near the top use wooden runners and open by pulling underneath the drawer front. 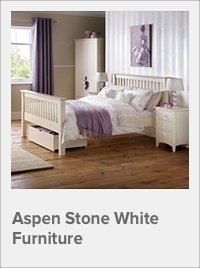 It is made from quality solid oak throughout and is carefully finished in a durable lacquer, which will help protect and enhance the beauty of this striking furniture. 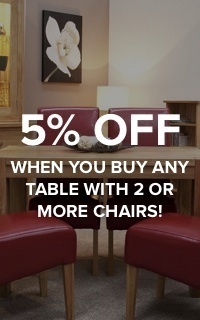 If you’re looking to create a modern eye-catching feel to your living or dining area, this oak furniture is perfect. The Z Shape Large Hall / Console Table with Drawers is manufactured from sustainably forested solid oak. 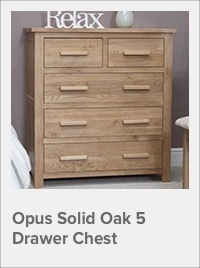 Solid oak drawer boxes with dovetail joints. Metal & oak drawer runners. Handle-less drawers with push action open/close. 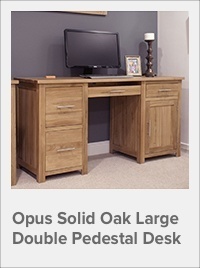 Manufactured from 100% solid Oak. 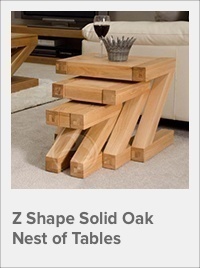 View the complete Z Oak Furniture range here. Width 136cm, depth 35cm, height 85cm.